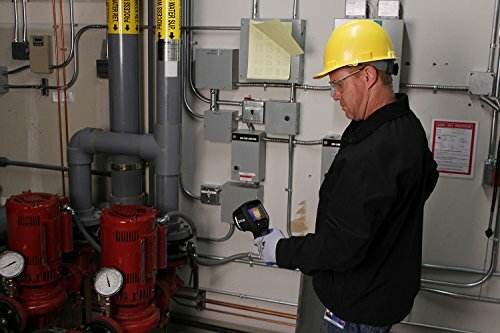 The FLIR E5 is a semi-commercial grade thermal imaging camera that can be used in a variety of thermal inspections. It is mostly suited for use in building, mechanical and electrical applications. The FLIR E5 allows you to discover issues not detectable with the human eye quickly giving you the time to diagnose the problem and correct before the issue causes a full shutdown potentially costing you or the company many thousands of dollars. The 3" 320 x 240 LCD screen, point-and-shoot design, and a wide range of selectable functions make it one of the best entry level inspection tools. It incorporates advanced MSX technology for image clarity and adding to its effectiveness and giving it a competitive edge. Its ergonomic buttons and user-friendly menus make it very easy to use as well. This camera comes with a free accessory kit giving you more value for your money. The package contains in-car charger, spare battery, FLIR thermal imaging software for image analysis on PC, and a spare battery. This innovative thermal camera features Multi-Spectral Digital Imaging for enhanced thermal clarity. MSX works by overlaying the visual image from the digital camera onto the thermal image in real time. It highlights where the exact problem is by showing details such as letters, numbers, textures, etc. You do not have to compare the digital and thermal images to identify a problem thanks to this technology. In the E5 thermal camera, this technology adds key details to the infrared image and onboard visible light camera in real time. Built in WIFI module allows you to send images and reports instantly via your smartphone, laptop, or tablet. You only need to download the FLIR app, install it on your device, and connect it to your camera via Wi-Fi and begin sharing images and reports. As a result, it is possible to make important decisions quickly without having to wait for data to be manually transferred. This thermal imaging camera comes with a lithium-ion 3.6V battery. After a quick charge via Micro USB cable, it can last for up to 4 hours. The FLIR E5 is straightforward and uncomplicated to operate. It features single button navigation. With this button, you can easily navigate the on-screen settings, measurement tools, saved JPEGS, and imaging modes. The FLIR warranty is better than almost any other brand. They offer coverage of ten years on the inbuilt thermal detector, five years on the batteries, and two years on the camera’s parts and labor. With the 5-10-2-warranty protection, it assures you of its quality. 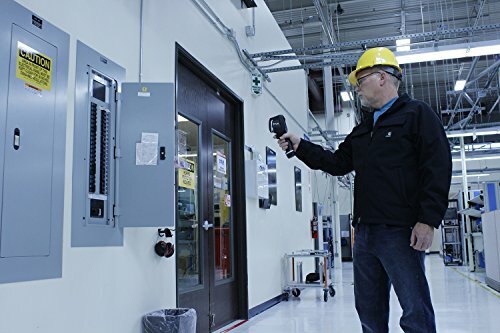 This thermal camera is ideally used for troubleshooting mechanical, electrical, and building problems. It can accurately detect the high temperatures on fuses, breakers, and connections making it easier for you to troubleshoot any issue. In building analysis, you can quickly discover structural issues, moisture intrusion and energy waste. Also, you can use this FLIR camera in HVAC work to track cooling/heating system duct disconnects and mechanical wear among many others. The FLIR Ex-Series (E4, E5, E6, and E8) thermal cameras are well known for their ability to capture vibrant thermal images taking care of all the details with high accuracy. However, these models differ slightly mainly regarding the screen options and thermal resolution. FLIR E6 is an upgraded version of E5. It has a higher resolution of 160 × 120 pixels (total of 19,200 pixels vs 10,800 on E5) meaning that the images taken on an E5 have less pixels than pictures taken on an E6. It has a thermal sensitivity of less than 0.06°C, which is an improvement of the E5’s <0.10°C. With the E6, you can detect even lesser temperature differences than you can on E5. While the E6 and other higher-range FLIR models have higher resolution and enhanced thermal sensitivity, the E5 seems to gain more popularity, as it combines high precision and yet is still affordable. It does not compromise on accuracy and effectiveness. It is light in weight making it comfortable to use and carry along as well. Along with the thermal image, it offers regular digital imaging. It is easy to access the files by transferring them to a computer via a USB cable for further analysis. It has a large viewing filed and is capable of showing the image in grey, iron, and rainbow color palettes. It is easy to use as you can control most of its settings from a single button. It has a lower resolution compared to FLIR E6 and E8. Outside the warranty, the repairs can be quite expensive. For professionals, 4 hours of operation might not be enough. 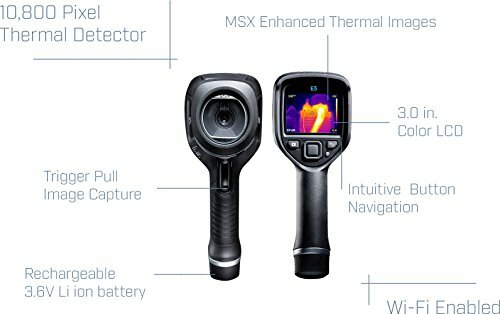 The FLIR E5 Thermal Imaging Camera is highly effective for use by any individual or business in need of a high quality semi-commercial grade thermal camera but also wanting to keep costs down. It is affordable, yet it employs some of the most sophisticated technology. It is effective in numerous applications that include pinpointing sources of leakages, clogs in pipes, condensation, HVAC issues etc. allowing you to take the necessary actions to correct. The inclusion of MSX technology makes it possible for you to clearly reveal a problem in overheating mechanical and electrical equipment and the source of moisture intrusion, energy loss, and other structural issues easily. Its versatility, ease of use, and ability to save on time makes it an ideal device for use. It is user-friendly; whether you are highly experienced or have little knowledge of the process of thermal image navigation and analysis. 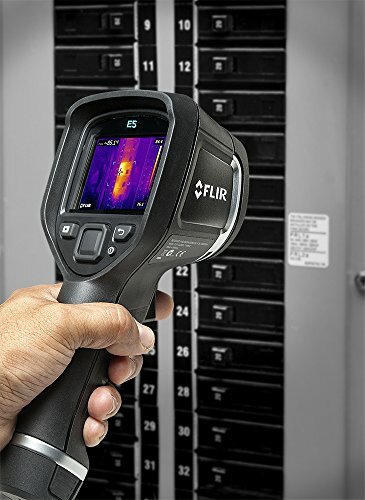 You can comfortably and confidently use the FLIR E5 for your daily inspection needs.